We want Dead Man's Snitch to be a great fit for teams of any size. So all of our paid plans allow you to invite as many team members as you need, at no extra cost. All team members are able to monitor and manage Snitches, create new API keys, and add or develop their own integrations. Ready to get started? Start inviting your team now. Along with better support for teams, we're also introducing Cases, a new way to separate your Snitches by project or team. 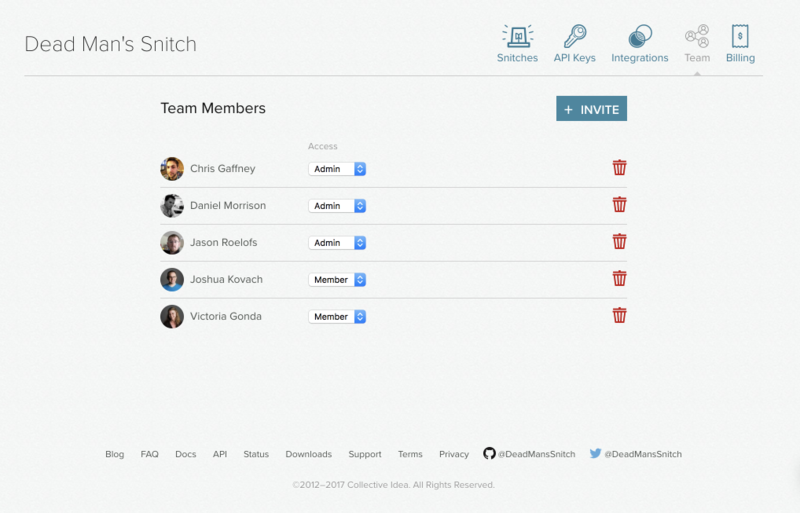 With Cases, you can organize Snitches from multiple projects, applications, or teams in a way that makes sense to you. There's also no need to log in and out to access the Cases. Each Case has its own set of team members and integrations, so alerting the right team members of any issues is easy. Need help moving Snitches around? Let us know and we can help move your Snitches between Cases. Dead Man’s Snitch now supports multiple API keys. The ability to enable or disable API access over a variety of services will give you more control, security, and granularity. If you are currently utilizing an API key through Dead Man’s Snitch, that key will continue to work without interruption. For more information on multiple API keys, visit our documentation.